If you haven't noticed the expanded produce section at the Golden Springs Winn-Dixie, it might be worth a drive out there to see what's going on. Among the listings: two types of artichokes (see Wedneday's food section for a recipe and how to prepare the things) and a handful of different types of salad greens, cabbages, Asian vegetables. Eggplant is one of those vegetables the rest of the world loves, but Americans seem reluctant to dive right in to. That's a shame, because it grows well in our gardens around here, and now there's a ready selection to pick from. 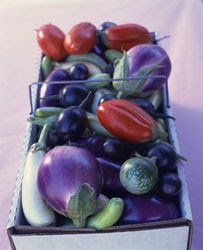 Eggplant -- known as the aubergine everywhere outside North America -- is a member of the nightshade family. (Although I've heard it referred to as "eggplant" in Australia, so maybe that name is fair game in the Australia-New Zealand sphere). It's native to India and has been eaten since pre-historic times. Leading producers: China, India, Egypt and Japan. One of the more unusual dishes I've ever had was at a Chinese restaurant in the Russian Far East, just across the border from northern China. It was a stewed eggplant dish, served cold. I admit, the texture set me back at first, but once I adjusted to eating cold eggplant, the flavor was solid. 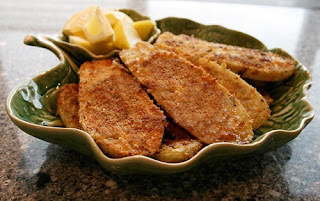 While raw eggplant can taste bitter, it quickly mimics the other flavors that it's cooked with. It can absorb a lot of oil, though, so be frugal in brushing on the olive oil or other fats. Recipes use all our favorite Southern cooking techniques: grilling, frying and tossing everything into one pot. 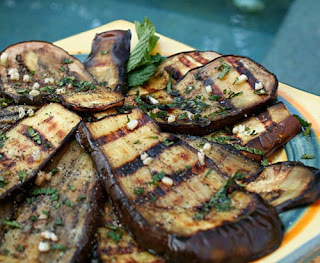 Roasting is also an easy way to enjoy eggplant.